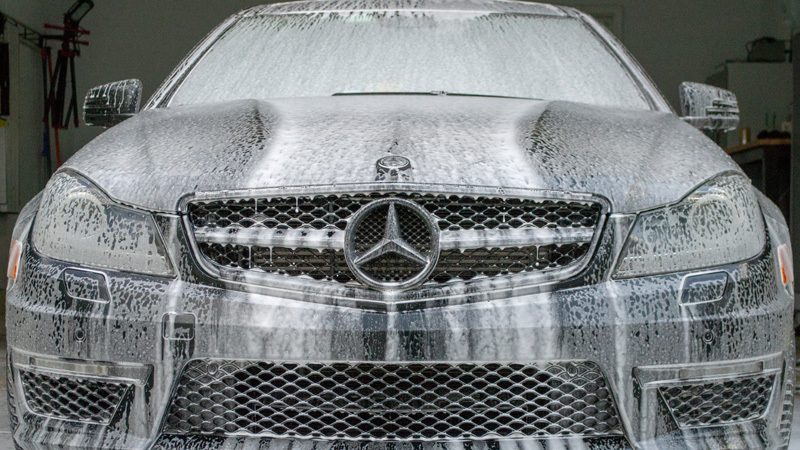 Once a year, the owner of this sporty Mercedes C63 AMG gets his car detailed. The car was in decent shape, but there were a few areas that really needed attention. The customer decided to go with our Essential Interior detail and our Exterior Detail option. 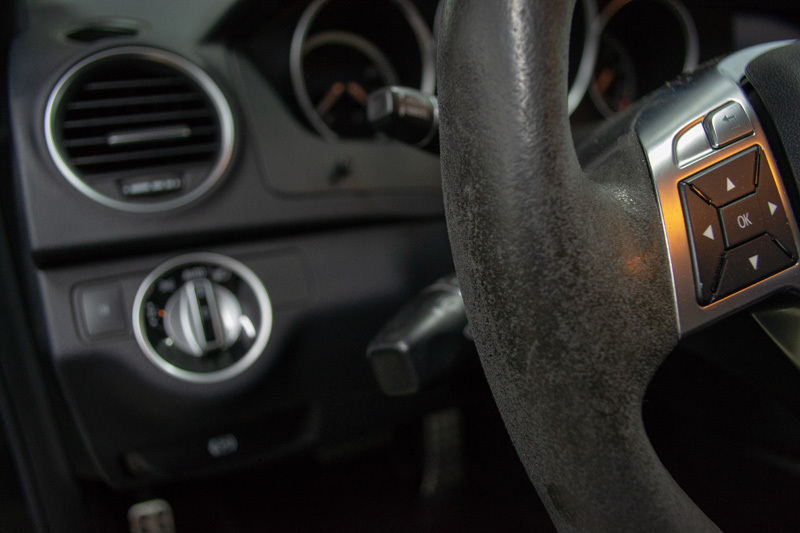 Upon further inspecting the Mercedes, one area that really showed a bit of this vehicles age was the steering wheel. 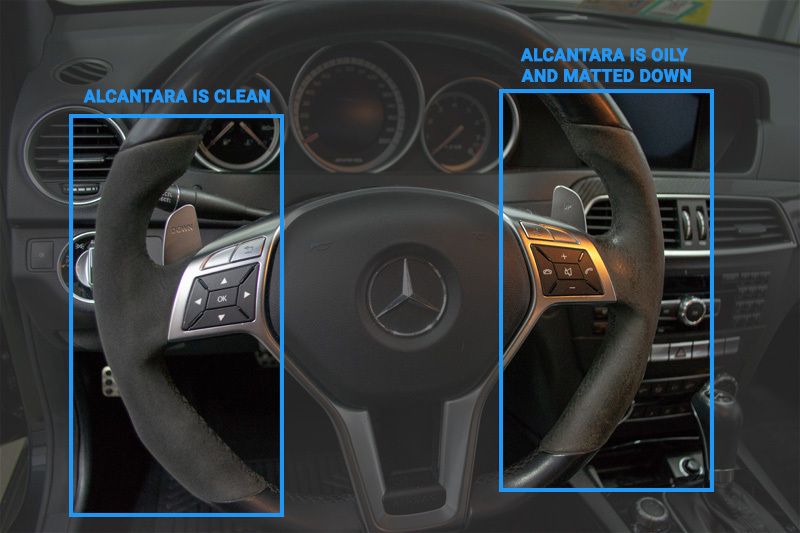 After years of gripping tight around corners, the oils and residue from hands took it’s toll on the Alcantara leather steering wheel. We decided to snap a picture after we detailed the left side of the steering wheel. As you can see, this is what Alcantara should look like. Plush, even color, and enticing to grip. Overall this 6 year old Mercedes interior turned out incredible, restoring it to a like-new condition. The customer couldn’t believe how well the steering wheel cleaned up. After the interior was all cleaned up, we moved on to the exterior. The car needed a thorough wash and decontamination. And upon further inspection, the wheels and brake calipers needed some additional attention due to the large amount of brake dust that has accumulated. We soaked the car in Meguiar’s Hyperwash to loosen all the dirt and debris. After treating the wheels and brake calipers the car was rinsed and dried, prepping the Mercedes for the rest of the detail. We use a special blower that helps us dry every crack and crevice, so when you drive away, there are minimal water spots and drip marks from water hiding in areas where towels can’t reach. This is especially helpful between panels, lug nuts, the trunk, gas cap, and especially side mirrors. As we wrapped up the vehicle, we shot a few after photos. Overall, the customer was very happy and made the comment that he has never seen his car this clean before. Have questions on anything we do? We’d love to hear from you.